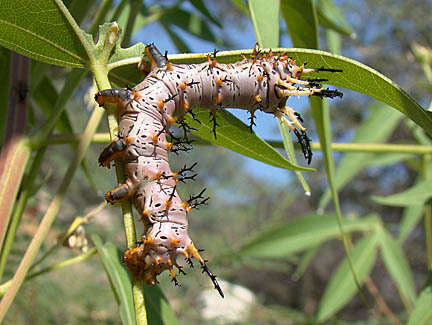 A fresh Achemon Sphinx (Eumorpha achemon) resting on a branch in the front yard. The local host plant is Canyon grape (4 August 2007). 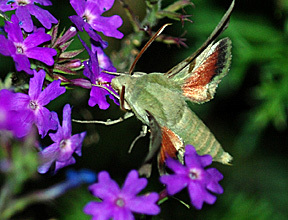 A tiny green Terloo Sphinx Moth (Proserpinus terlooii), one of two present at the time, nectars on verbena (24 July 2008). 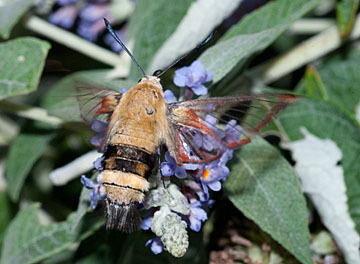 An uncommon species in the yard is the Hummingbird Sphinx (Hemaris thetis - taxonomy being reexamined). 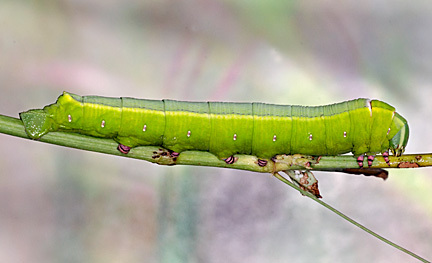 Here one feeds on Buddleia (19 August 2010). 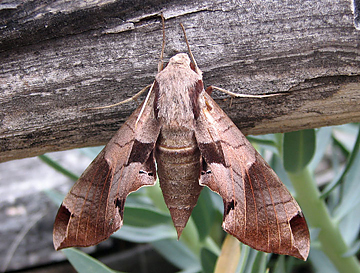 A locally uncommon sphinx moth (Aellopos sp. possibly A. clavipes) nectaring on Verbena pulchella (12 August 2006) (Id. suggested by Cliff Ferris). 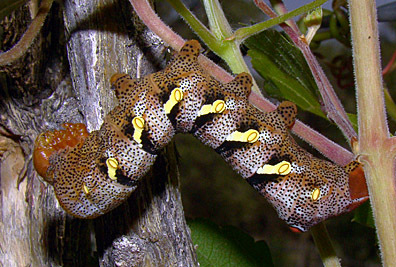 A very pretty brown morph Typhon Sphinx (Eumorpha typhon) feeding on grape vine (3 September 2012). Ello Sphinx moths feed on several species of euphorbs including wild poinsettia, as was this one (above and below) (5 September 2017). 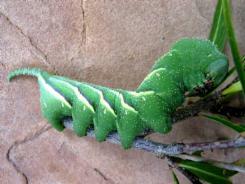 This was the fifteenth sphinx moth found in the yard. 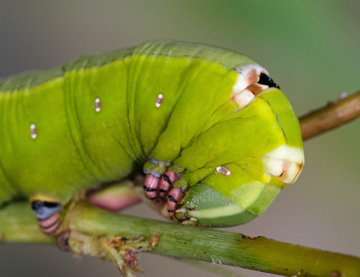 A Small-eyed Sphinx feeding on cherry. 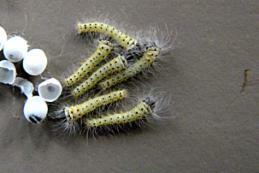 There were about eight of them on this small plant and they pretty much stripped it. Some had more red spots. (6 September 2012). 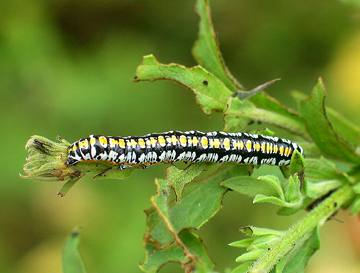 A Muscosa Sphinx caterpillar feeding on the locally common sunflower Helianthus petiolaris (27 August 2014). 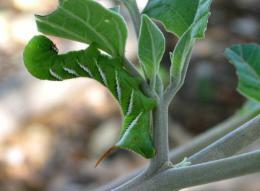 A Five-spotted Hawkmoth (Tomato Hornworm) caterpillar feeding on Silver-leaf Nightshade (3 September 2017). 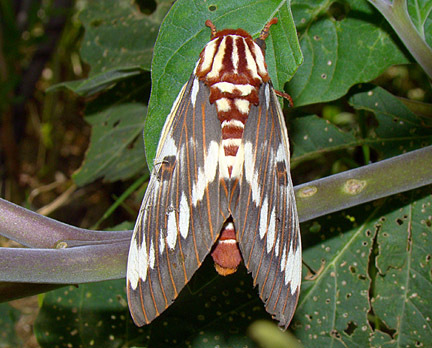 Manduca rustica on Desert Willow (25 July 2005) (Karen LeMay photo) (L), Manduca sexta on Datura (24 July 2006) (R). 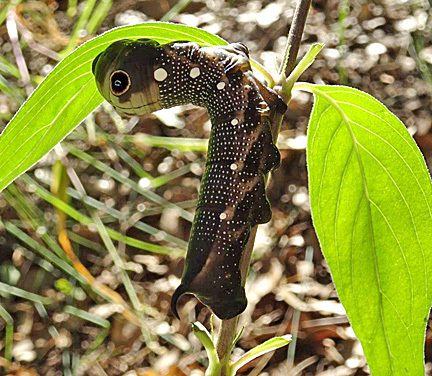 The gaudy caterpillar of a Falcon Sphinx feeding on its host plant Bouvardia (9 October 2016). 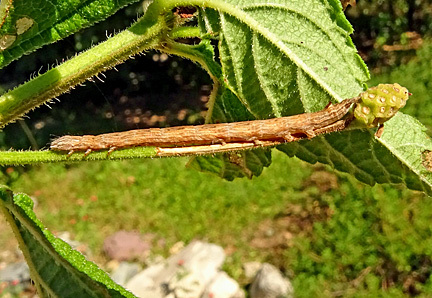 Caterpillars of the Lantana Stick Moth are remarkably inch-worm-like, but are actually owlet moths (Family Noctuidae). Native from the southern U.S. to Argentina, they have been introduced elsewhere (i.e., Australia) to control lantanas (12 September 2017). Thanks to Dave Wagner for the id. 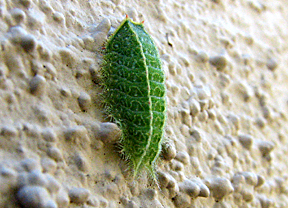 A limacodid caterpillar (Isa schaefferana) sits on a stucco wall near its oak hostplant (8 October 2007) (Id. Marc Epstein). 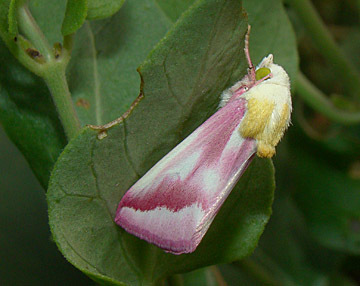 Related to silk moths is Dicogaster coronada (Family Lasiocampidae) (above). 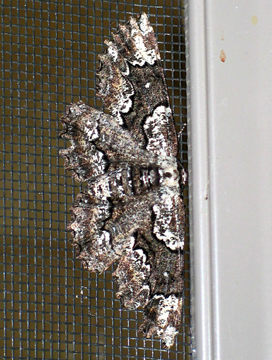 This female came in to a lit window on 4 Aug 2007 (id. Bruce Walsh). 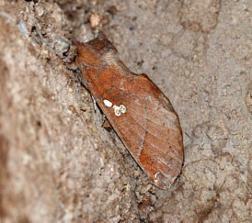 She remained here and oviposited on 10 August (below left). 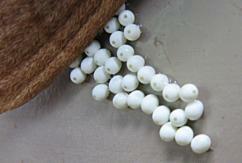 The eggs began to hatch on 25 August (below right). 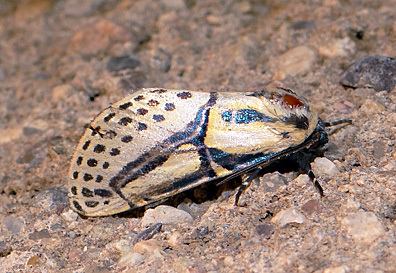 Pseudhapigia brunnea, a member of the family Notodontidae, is a decidedly local species with little presence in the U.S. These came to the porch light (3 and 4 August 2008). 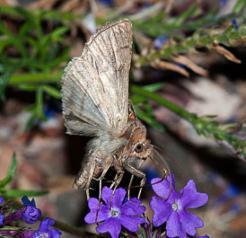 The pretty Hieroglyphic Moth (Nolidae: Diphthera festiva) seems to be uncommon here. 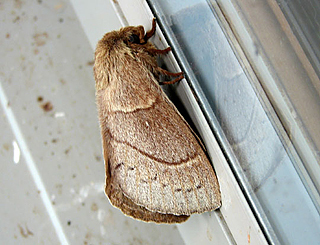 I am aware of three found locally the week this one was seen (18 September 2015). 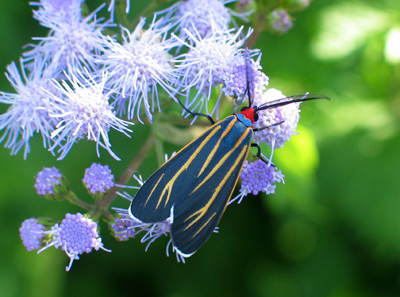 The locally common Ctenucha venosa on Eupatorium (2 Sep 2005). Found in much of the U.S., this Clouded Crimson (Schinia gaurae) uses various species of gaura. (25 August 2012). Oculea Silkmoth (Antheraea oculea) at light on porch (1 Aug 2004) (L); Dichorda consequaria (Family Geometridae-inchworms) at light (16 Nov 2005) (Id. Noel McFarland) (R). 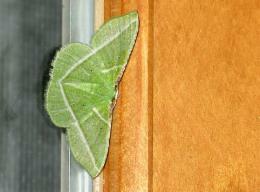 Another geometrid, a female Nacophora cristifera at a lit window (26 July 2007). 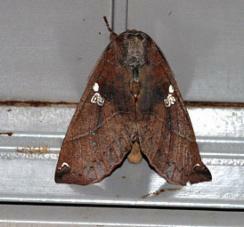 The Bilobed Looper (Megalographa biloba) is a a member of the family Noctuidae. 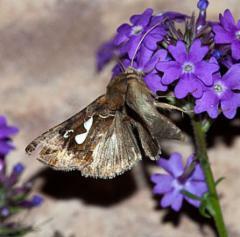 Here, one nectars at dusk on verbena (10 July 2010) (Id. Noel McFarland). The huge Black Witch is a summer visitor from the tropics. Here, a male roosts on the porch (22 Aug 2005). 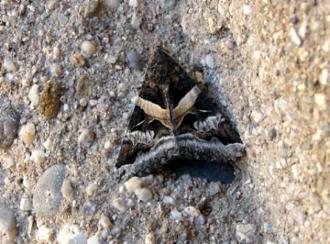 The noctuid Opsigalea blanchardi uses Buddleia as a host plant (6 September 2006) (Id. Noel McFarland). 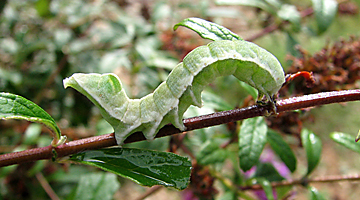 This beautiful caterpillar is a Western grape leaf skeletonizer (Harrisina metallica) (Family Zygaenidae), a species that can cause significant damage to grape crops. 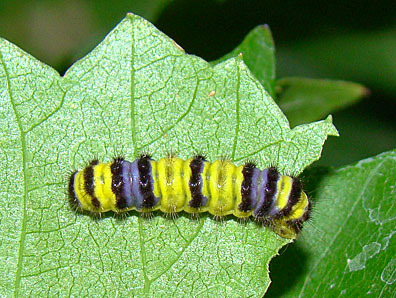 Several were present in the yard on Canyon grape (26 June 2010) (Id. Noel McFarland). 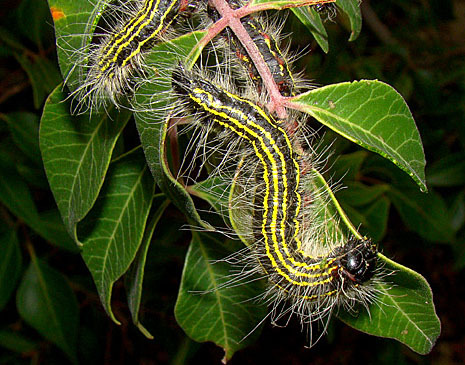 Cucullia (Family Noctuidae) is a large genus with many beautiful caterpillars that become small, brown moths. Thus far, we have found five species in the yard. Here, one feeds on aster (6 September 2006). 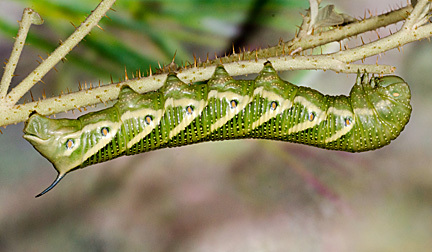 A caterpillar in the family Notodontidae, probably Datana perfusa on a sumac, one of about 15 on the shrub (11 September 2012) (Id. Dave Wagner). 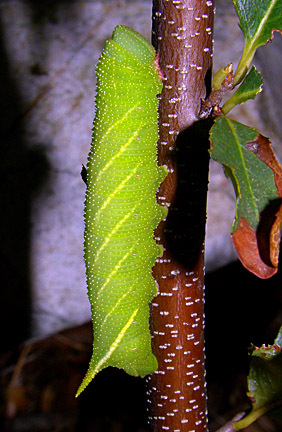 A spectacular caterpillar of Citheronia splendens, a moth related to the more easterly Hickory Horned Devil/Regal Moth (Citheronia regalis). 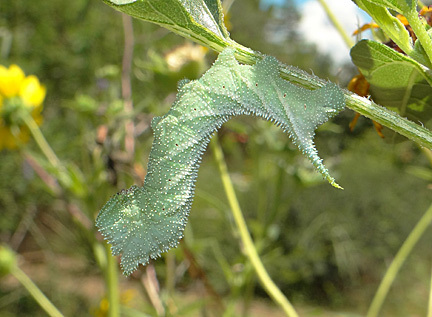 Eggs are on wild cotton and the caterpillars may be quite numerous (3 September 2012). 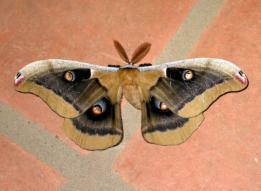 The horned caterpillar (second above) turns into this beautiful moth (28 July 2013). 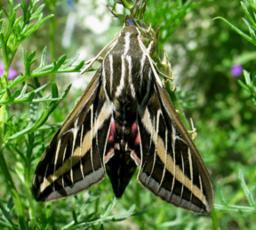 A White-lined Sphinx Moth, a common local species, feeds on Gaura (10 August 2006). 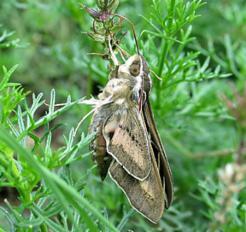 White-lined Sphinx Moth (Hyles lineata) (6 August 2006) (Karen LeMay photos). 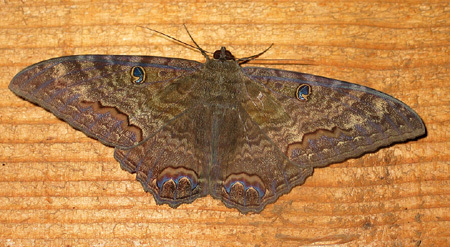 Melipotis indomita, a noctuid, at light (11 June 2006) (Id. C. D. Ferris).